The sessions at JAOO will run at three different neighboring buildings. 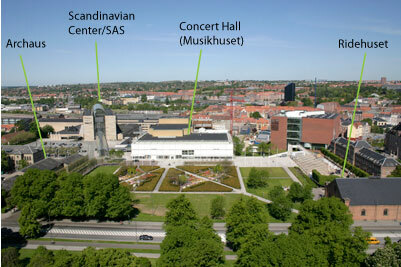 The keynotes and most tracks will take place in the Musikhuset (The Concert Hall). In the foyer of Musikhuset you will find the exhibition area. Tracks with focus on agility will run in Scandinavian Congress Center. Lunch will be served every day in Ridehuset (an old building used for training horses). The Conference Party Monday evening will take place here as well. As a new thing this year Archauz (Center for Modern Dance) will house various activities like BoF's and Jam Sessions. At JAOO you will find catering indoors all day. Find water and coffee at different stations in the conference area. The lunch is served in Ridehuset from 12-13 each day. Enjoy the food from Chili John. In the afternoon you will find coffee, tea & cake/fruit in the exhibition area.